Galerius (/ɡəˈlɛərɪəs/; Latin: Gaius Galerius Valerius Maximianus Augustus; c. 260 – April or May 311) was Roman Emperor from 305 to 311. During his reign he campaigned, aided by Diocletian, against the Sassanid Empire, sacking their capital Ctesiphon in 299. He also campaigned across the Danube against the Carpi, defeating them in 297 and 300. Although he was a staunch opponent of Christianity, Galerius ended the Diocletianic Persecution when he issued an edict of toleration in 311. Galerius was born in Serdica, though some modern scholars consider the strategic site where he later built his palace named after his mother – Felix Romuliana (Gamzigrad) – his birth and funeral place. His father was a Thracian and his mother Romula was a Dacian woman, who left Dacia because of the Carpians' attacks. :19 He originally followed his father's occupation, that of a herdsman, where he got his surname of Armentarius (Latin: armentum, herd). He served with distinction as a soldier under Emperors Aurelian and Probus, and in 293 at the establishment of the Tetrarchy, was designated Caesar along with Constantius Chlorus, receiving in marriage Diocletian's daughter Valeria (later known as Galeria Valeria), and at the same time being entrusted with the care of the Illyrian provinces. After a few years campaigning against Sarmatians and Goths on the Danube, he received command of the legions on the eastern Imperial limits. Soon after his appointment, Galerius would be dispatched to Egypt to fight the rebellious cities Busiris and Coptos. In 295 or 296, Narseh declared war on Rome. He appears to have first invaded western Armenia, retaking the lands delivered to Tiridates in the peace of 287. He would occupy the lands there until the following year. :149:292 The late historian Ammianus Marcellinus is the only source detailing the initial invasion of Armenia. Southern (1999, 149) dates the invasion to 295; Barnes (1982, 17, 293) mentions an earlier, unsuccessful invasion by Narseh based on the fact that the title Persici Maximi was given to all four emperors; Odahl (2004, 59) concurs with Barnes and suggests that Saracen princes in the Syrian desert collaborated with Narseh's invasion. Narseh then moved south into Roman Mesopotamia, where he inflicted a severe defeat on Galerius, then commander of the Eastern forces, in the region between Carrhae (Harran, Turkey) and Callinicum (Ar-Raqqah, Syria). Diocletian may or may not have been present at the battle,:652 but would present himself soon afterwards at Antioch, where the official version of events was made clear: Galerius was to take all the blame for the affair. In Antioch, Diocletian forced Galerius to walk a mile in advance of his imperial cart while still clad in the purple robes of an emperor. :292–3 The message conveyed was clear: the loss at Carrhae was not due to the failings of the empire's soldiers, but due to the failings of their commander, and Galerius' failures would not be accepted. It is also possible that Galerius' position at the head of the caravan was merely the conventional organization of an imperial progression, designed to show a Caesar's deference to his Augustus. Galerius had been reinforced, probably in the spring of 298, by a new contingent collected from the empire's Danubian holdings. Narseh did not advance from Armenia and Mesopotamia, leaving Galerius to lead the offensive in 298 with an attack on northern Mesopotamia via Armenia. Diocletian may or may not have been present to assist the campaign. Narseh retreated to Armenia to fight Galerius' force, to Narseh's disadvantage: the rugged Armenian terrain was favorable to Roman infantry, but not to Sassanid cavalry. Local aid gave Galerius the advantage of surprise over the Persian forces, and, in two successive battles, Galerius secured victories over Narseh. Narseh had previously sent an ambassador to Galerius to plead for the return of his wife and children, but Galerius had dismissed this ambassador, reminding him of how Shapur had treated Valerian. The Romans, in any case, treated Narseh's captured family with tact, perhaps seeking to evoke comparisons to Alexander and his beneficent conduct towards the family of Darius III. Peace negotiations began in the spring of 299, with both Diocletian and Galerius presiding. Their magister memoriae (secretary) Sicorius Probus was sent to Narseh to present terms. After the elevation of Constantius I and Galerius to the rank of Augusti, two new Caesars were required to supply their place, and to complete the system of the Imperial government. The two persons whom Galerius promoted to the rank of Caesar were very much Galerius' creatures, and he hoped to enhance his authority throughout the empire with their elevation. First was Maximinus Daia, whose mother was Galerius' sister. An inexperienced youth with little formal education, he was invested with the purple, exalted to the dignity of Caesar, and assigned the command of Egypt and Syria. Second was Severus, Galerius' comrade in arms; he was sent to Milan to receive the possession of Italy and Africa. According to the forms of the constitution, Severus acknowledged the supremacy of the western emperor; but he was absolutely devoted to the commands of his benefactor Galerius, who, reserving to himself the intermediate countries from the confines of Italy to those of Syria, firmly established his power over three quarters of the empire. His hopes were dashed when his colleague Constantius died at York in 306 and the legions elevated his son Constantine to the position of Augustus. Galerius only discovered this when he received a letter from Constantine, who informed him of his father's death, modestly asserted his natural claim to the succession, and respectfully lamented that the enthusiastic violence of his troops had not allowed him to obtain the Imperial purple in the regular and constitutional manner. The first emotions of Galerius were those of surprise, disappointment, and rage; and, as he could seldom restrain his passions, he threatened to burn both the letter and the messenger. But when he had time to reconsider his position, he inevitably saw that his chances of winning a war against Constantine were doubtful at best. Galerius was well aware of Constantine’s strengths – Constantine had been his guest for some time at Nicomedia – and knew that Constantius' legions were wildly devoted to his son. Therefore, without either condemning or ratifying the choice of the British army, Galerius accepted the son of his deceased colleague as the ruler of the provinces beyond the Alps; but he gave him only the title of Caesar, and the fourth rank among the Roman princes, whilst he conferred the vacant place of Augustus on his favourite Severus. The ambitious spirit of Galerius was only just over this disappointment when he beheld the unexpected loss of Italy to Maxentius, who was married to his daughter Valeria Maximilla. Galerius’ need for additional revenue had persuaded him to make a very strict and rigorous examination of the property of his subjects for the purpose of a general taxation. A very minute survey was taken of their real estates and, wherever there was the slightest suspicion of concealment, torture was used to obtain a sincere declaration of their personal wealth. Italy had traditionally been exempt from any form of taxation, but Galerius ignored this precedent, and the officers of the revenue already began to number the Roman people, and to settle the proportion of the new taxes. Italy began to murmur against this indignity and Maxentius used this sentiment to declare himself emperor in Italy, to the fury of Galerius. Therefore, Galerius ordered his colleague Severus to immediately march to Rome, in the full confidence that, by his unexpected arrival, he would easily suppress the rebellion. Severus was captured after his troops deserted to their old commander Maximian, who had once again been elevated to the rank of co-emperor, this time by his son Maxentius. Severus was later executed. The importance of the occasion needed the presence and abilities of Galerius. At the head of a powerful army collected from Illyricum and the East, he entered Italy, determined to avenge Severus and to punish the rebellious Romans. :122 But due to the skill of Maximian, Galerius found every place hostile, fortified, and inaccessible; and though he forced his way as far as Narni, within sixty miles of Rome, his control in Italy was confined to the narrow limits of his camp. Seeing that he was facing ever-greater difficulties, Galerius made the first advances towards reconciliation, and dispatched two officers to tempt the Romans by the offer of a conference, and the declaration of his paternal regard for Maxentius, reminding them that they would obtain much more from his willing generosity than anything that might have been obtained through a military campaign. The offers of Galerius were rejected with firmness, his friendship refused, and it was not long before he discovered that unless he retreated, he might have succumbed to the fate of Severus. 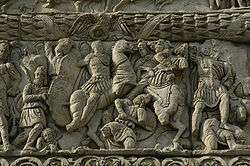 It was not a moment too soon; large monetary gifts from Maxentius to his soldiers had corrupted the fidelity of the Illyrian legions. When Galerius finally began his withdrawal from Italy, it was only with great difficulty that he managed to stop his veterans deserting him. In frustration, Galerius allowed his legions to ravage the countryside as they passed northwards. Maxentius declined to make a general engagement. With so many emperors now in existence, in 308 Galerius, together with the retired emperor Diocletian and the now active Maximian, called an imperial 'conference' at Carnuntum on the River Danube to rectify the situation and bring some order back into the imperial government. :120 Here it was agreed that Galerius’ long-time friend and military companion Licinius, who had been entrusted by Galerius with the defense of the Danube while Galerius was in Italy, would become Augustus in the West, with Constantine as his Caesar. In the East, Galerius remained Augustus and Maximinus remained his Caesar. 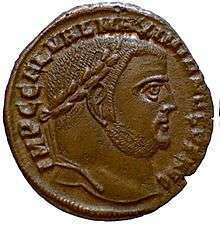 Maximian was to retire, and Maxentius was declared a usurper. Galerius’ plan soon failed. The news of Licinius’ promotion was no sooner carried into the East, than Maximinus, who governed the provinces of Egypt and Syria, rejected his position as Caesar, and, notwithstanding the prayers as well as arguments of Galerius, exacted the equal title of Augustus. For the first, and indeed for the last time, six emperors administered the Roman world. And though the opposition of interest, and the memory of a recent war, divided the empire into two great hostile powers, their mutual fears and the fading authority of Galerius produced an apparent tranquility in the imperial government. 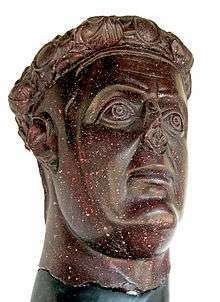 The last years of Galerius saw him relinquishing his aspirations towards being the supreme emperor of the empire, though he managed to retain the position of first among equals. He spent the remainder of his years enjoying himself and ordering some important public works, such as discharging into the Danube the superfluous waters of Lake Pelso, and cutting down the immense forests that encompassed it. 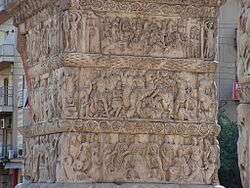 Detail of the Arch of Galerius in Thessaloniki. Christians had lived in peace during most of the rule of Diocletian. The persecutions that began with an edict of February 24, 303, were credited by Christians to Galerius' work, as he was a fierce advocate of the old ways and old gods. Christian houses of assembly were destroyed, for fear of sedition in secret gatherings. Diocletian was not anti-Christian during the first part of his reign, and historians have claimed that Galerius decided to prod him into persecuting them by secretly burning the Imperial Palace and blaming it on Christian saboteurs. Regardless of who was at fault for the fire, Diocletian's rage was aroused and he began one of the last and greatest Christian persecutions in the history of the Roman Empire. It was at the insistence of Galerius that the last edicts of persecution against the Christians were published, beginning on February 24, 303, and this policy of repression was maintained by him until the appearance of the general edict of toleration, issued from Nicomedia in April 311, apparently during his last bout of illness (see Edict of Toleration by Galerius). Galerius's last request, that Christians should pray for him as he suffered with a painful and fatal illness, was in vain for he died six days later. Galerius died in late April or early May 311 from a horribly gruesome disease described by Eusebius and Lactantius, possibly some form of bowel cancer, gangrene or Fournier gangrene. Galerius was buried in his mausoleum at Gamzigrad-Romuliana, which was part of the palace he built at his birthplace, today's Zaječar in Serbia. The entire site has been inscribed into the World Heritage List in June 2007. According to Lactantius, Galerius affirmed his Dacian identity and avowed himself the enemy of the Roman name once made emperor, even proposing that the empire should be called, not the Roman, but the Dacian Empire, much to the horror of the patricians and senators. He exhibited anti-Roman attitude as soon as he had attained the highest power, treating the Roman citizens with ruthless cruelty, like the conquerors treated the conquered, all in the name of the same treatment that the victorious Trajan had applied to the conquered Dacians, forefathers of Galerius, two centuries before. McGiffert, Arthur Cushman, trans. Church History. From Nicene and Post-Nicene Fathers, Second Series, Vol. 1. Edited by Philip Schaff and Henry Wace. Buffalo, NY: Christian Literature Publishing Co., 1890. Revised and edited for New Advent by Kevin Knight. Online at New Advent. Accessed 25 August 2009. Fletcher, William, trans. Of the Manner in Which the Persecutors Died. From Nicene and Post-Nicene Fathers, Second Series, Vol. 7. Edited by Alexander Roberts, James Donaldson, and A. Cleveland Coxe. Buffalo, NY: Christian Literature Publishing Co., 1886. Revised and edited for New Advent by Kevin Knight. Online at New Advent. Accessed 25 August 2009. Banchich, Thomas M. "Iulianus (c. 286–293 AD)." De Imperatoribus Romanis (1997). Accessed March 8, 2008. DiMaio, Jr., Michael. "Constantius I Chlorus (305–306 AD)." De Imperatoribus Romanis (1996a). Accessed March 8, 2008. DiMaio, Jr., Michael. "Galerius (305–311 AD)." De Imperatoribus Romanis (1996b). Accessed March 8, 2008. DiMaio, Jr., Michael. "Maximianus Herculius (286–305 AD)." De Imperatoribus Romanis (1997). Accessed March 8, 2008. Mathisen, Ralph W. "Diocletian (284–305 AD.)." De Imperatoribus Romanis (1997). Accessed February 16, 2008. Pohlsander, Hans. "Constantine I (306 – 337 AD)." De Imperatoribus Romanis (2004b). Accessed December 16, 2007. ↑ This edition and translation is not very good. The pagination is broken in several places, there are many typographical errors (including several replacements of "Julian" with "Jovian" and "Constantine" with "Constantius"). It is nonetheless the only translation of the Historia Nova in the public domain. ↑ Barnes, Constantine and Eusebius, pp. 8–9. 1 2 3 4 5 6 Barnes, New Empire . 1 2 3 4 5 Potter, The Roman Empire at Bay . 1 2 3 4 5 6 Southern, Severus to Constantine . 1 2 3 Williams, Diocletian . ↑ The earlier dates for Galerius' appointment have been argued for based on the suggestion that the appointments of Constantius and Galerius were timed to coincide (Barnes 1981, 8–9; Southern 1999, 146). Barnes (1982, 62) argues against a dating of 21 May 293 in Nicomedia originating in Seston, Dioclétien, 88ff., stating that the evidence adduced (the Paschal Chronicle 521 = Chronica Minora 1.229 and Lactantius, DMP 19.2) is invalid and confused. Lactantius is commenting on Diocletian and the place where Diocletian was acclaimed, and that the "Maximianus" in the text is therefore a later gloss; the Paschal Chronicle is not authoritative for this period for events outside Egypt, and may simply be commenting on the day when the laureled image of the new emperors arrived in Alexandria. Potter (2004, 650) agrees that locating the acclamation to Nicomedia is false, but believes that Seston's other evidence makes a strong case for a temporal lag between the two Caesars' acclamations. 1 2 3 Barnes, New Empire, p. 4. ↑ Lactantius, DMP 35.4. The exact date is lost in a lacuna (Barnes 1982, 6). 1 2 Barnes, New Empire, p. 37. ↑ In Classical Latin, Galerius' name would be inscribed as GAIVS GALERIVS VALERIVS MAXIMIANVS AVGVSTVS. ↑ "Maximianus Galerius in Dacia haud longe a Serdica natus", Eutropii Breviarum IX. 22. ↑ Lactantius, de Mortibus Persecutorum . 1 2 3 Barnes, Constantine and Eusebius, p. 17. ↑ Potter (2004), pp. 651–2 Missing or empty |title= (help). 1 2 3 4 5 6 7 Potter, The Roman Empire at Bay, p. 293. 1 2 3 4 5 6 7 Barnes, Constantine and Eusebius, p. 18. ↑ Lactantius (DMP 9.6) derides Diocletian for his absence from the front; Southern (1999, 151, 335–36), on the basis of a dating of the African campaigns one year earlier than that given by Barnes, places him at Galerius' southern flank. Southern sees the Persian campaign progressing along the lines of Marcus Aurelius' (r. 161–80) earlier, unsuccessful Parthian campaign, which also had an emperor manning the southern flank. ↑ The acceptance of these terms by the Persians also meant that Syriac culture would earn long-term influence in the region on both sides of the Tigris. With the heavily Christian Syriac peoples so near their border, Armenia would also become susceptible to Christian influence in later years, leading to its eventual conversion under Tiridates. Potter, The Roman Empire at Bay, p. 293. 1 2 3 4 5 6 7 Gibbon, Edward, "14", Decline and Fall of the Roman Empire . ↑ DiMaio, Jr., Michael. Maxentius (306-312 A.D.). De Imperatoribus Romanis: An Online Encyclopedia of Roman Rulers and Their Families. Retrieved 20 July 2013. ↑ Davidson, J. (2005). Birth of the Church: From Jesus to Constantine, AD30-312. Monarch Books. ISBN 978-1854246585. ↑ Roger Pearse, "Preface to the online edition of Zosimus' New History". 19 November 2003, rev. 20 August 2003. Accessed 15 August 2009. Wikimedia Commons has media related to Galerius.